When I was in the 8th grade a friend of mine was put on an ‘ice cream diet.’ No seriously! The doctor said that she was too skinny for her age and height and told her that she had to eat at least one cup of ice cream every night. Everyday my friend would complain how much she hated her new ‘diet’ and was so sick of ice cream! (GASP!!!) I was so mad at my friend for two reasons: 1. She was told that she HAD to eat ice cream every night and B. That she complained all about it. Ok maybe deep down inside I was just mad that SHE was living out my dreams of having ice cream for dinner. 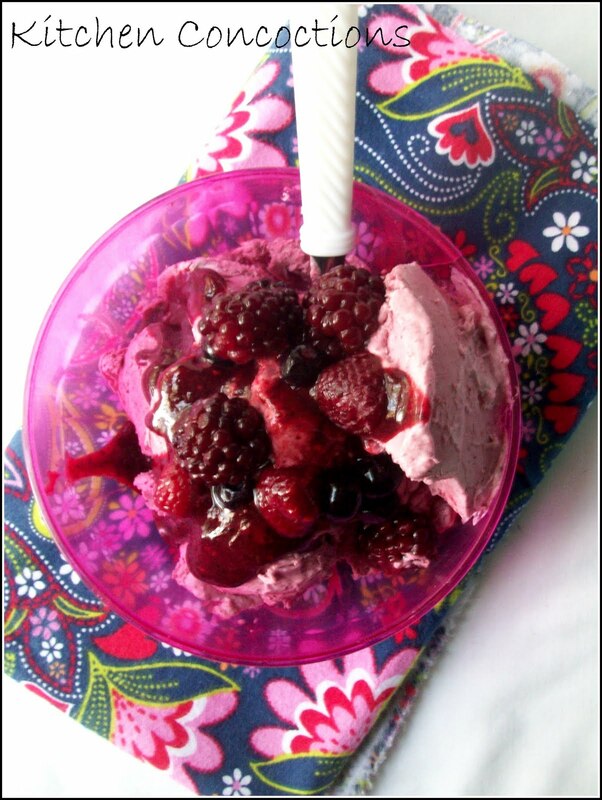 I am totally loving this Mixed Berry Ice Cream. Smooth, creamy and full of that sweet berry flavor. Since berries are bountiful this time of year this is a great way to use them up, if not frozen berries will work just fine. Oh and don’t forget to save the extra sauce, it totally makes this ice cream purrfect! Combine fruit and sugar in a food processor or blender and process until smooth. Reserve 1 cup of the puree (store in fridge until ready to use). In a mixing bowl, whip heavy whipping cream until medium peaks form. Gently fold in the remaining puree just until combined. Place in a freezer safe container and freeze until firm (about 2-4 hours). Scoop into bowls and serve with remaining puree and extra berries if desired. I'm sorry, this may sound mean, but I hate that girl! I soooo want to be on the ice cream diet! Especially with your mixed berry ice cream! How lucky! I wish I could go on a doctor- ordered ice cream diet, but I don't see that happening anytime soon! But you can bet that if I did, this ice cream would be on my list first! !